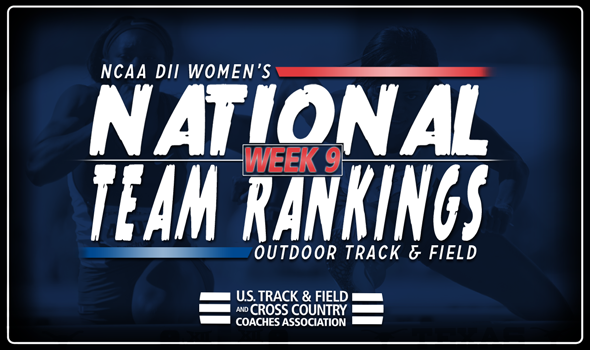 NEW ORLEANS – Not much changed in the top-five of the NCAA Division II Women’s Outdoor Track & Field National Team Rankings after a weekend in which athletes had their final chance to qualify for the NCAA Division II Outdoor Track & Field Championships. Four of the top-five teams remained in their respective spots from a week ago, announced the U.S. Track & Field and Cross Country Coaches Association (USTFCCCA) on Tuesday. Saint Augustine’s was the only newcomer to the party, moving up two spots to fourth. The Falcons took advantage of the Mount Olive Final Qualifier to put a few of its athletes in a better shot to advance to the outdoor championships. Magaly Tshipopo hit the eighth-best triple jump mark in NCAA Division II this year with a mark of 12.46m (40-10½) while Ade Hunter’s 400 time of 54.60 sits ninth on the Descending Order List. The fourth-place ranking for the Falcons is the highest the program has been since coming in at third during the final week of the 2016 season. Lincoln (Mo. ), Pittsburg State and West Texas A&M held onto the top-three spots in the rankings once again. Of those three schools, only Pittsburg State’s Jena Black hit an NCAA Division II top-10 Descending Order List mark this past weekend, notching an Automatic Qualifying Mark in the shot put with a throw of 16.11m (52-10¼) at the Missouri Southern Twilight Qualifier. Adams State rounded out the top-five in its familiar spot of fifth. Kandace Thomas ran a 23.73 (converted to 23.80 for altitude) in the 200 at the West Texas A&M Last Chance meet, putting her in sixth on the Descending Order List this year. Minor movement peppered the bottom half of the top-10, with one new team making its season-debut amongst the elite. Western State moved up four spots to 10th, joining the top-10 for the first time this season after Alicja Konieczek ran the eighth-fastest time in NCAA Division II history in the steeplechase at the Oxy Invitational. The product out of Poland notched a season-leading time of 9:57.14, good for an Automatic Qualifying Mark. Grand Valley State also enjoyed a boost in the rankings, moving up three spots to sixth after posting four top-10 NCAA Division II Descending Order List marks last week. Mary Hecksel’s discus throw of 51.75m (169-9) at the GVSU Wednesday-Last Chance Meet was good for an Automatic Qualifying Mark. Angelo State (seventh), Azusa Pacific (eighth) and San Francisco State (ninth) rounded out the top-10, although all three teams fell from a week ago. These are the final rankings that will include regular season marks. Next week’s rankings will only reflect those who qualify for the NCAA Division II Outdoor Track & Field Championships, which will be will be held in Charlotte, North Carolina, on May 24-26.